Don't currently use multiple blogs myself, but having a viewport to all blogs is such an obviously good feature to have, shame the categories aren't going to be ready for this release, but well done on getting this implemented. As a matter of interest, how will this affect the aggregate blog in presenting a collection of blogs where each has a high volume of posts i.e. is scalability going to become more of a priority? Hi Andy. Scalability has always been an issue, but the new aggregation feature does not make it worse, it's the same. If anything the multiple blogs feature from v2.5 will tend to cause more data (posts) to be written and stored in memory. 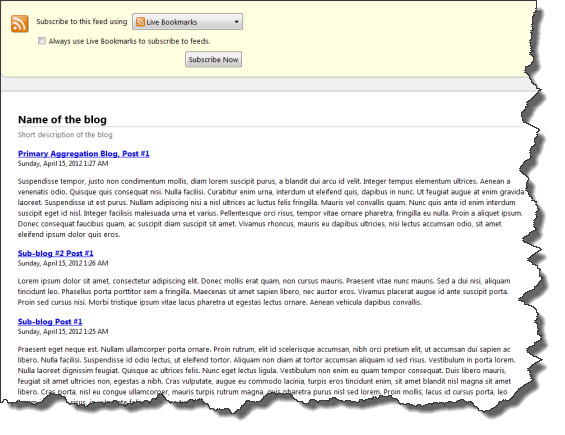 Before this site aggregation feature, the blog posts across all blog instances were being stored in memory. The site aggregation feature is taking all that blog post data (already in memory) and combining it into a single List that is sent to the normal PostList user control, with the normal paging. The PostList user control typically displays 10 posts or so at a time, so the performance here will not be affected. And so memory wise, the master List of posts used for the site aggregation is the only real impact which I believe is minimal since it's essentially a collection (or list) of pointers to Posts already in memory. We still need to address the core scalibility issue. Maybe via IQueryable. I think the XML storage makes it a lot more difficult to make it work, and DB only would be easier. XML is of course a super convenient way to run a blog though. Thanks for clarifying, that makes sense. I guess I was also thinking about things like related posts for example. In the aggregated instance that could be a rather large list to process if you are considering posts across all instances, but I suppose it comes back to the core issue of scalability and XML is indeed very appealing, especially for new BE users. Just thought I'd mention in case the glitch is not my end, got the comment notification email twice. Yeah, scalability will be a big topic to address. It'll be nice to come up with a solution for it some day. 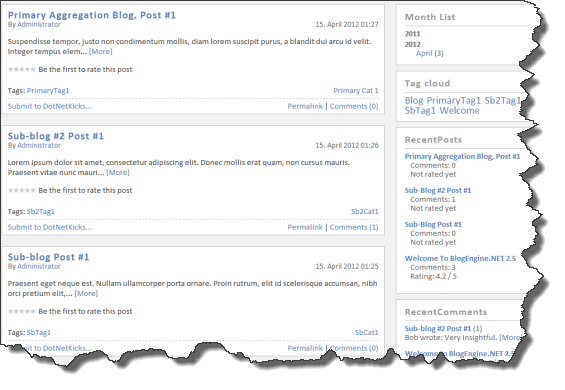 Really impressed with how the blog aggregation works. The first thing I did after downloading BE 2.6 release candidate was to have a look at a couple of the standard controls to see if there had been any changes to support aggregation and didn't see anything, so started poking around elsewhere based on the pointers in your post, still digesting the changes but credit where it's due - this is very nicely done.